First-place smile after a first-place performance. It was shaping up to be another disaster for Gang Green in the fourth quarter. A 24-6 lead had completely disappeared. The Patriots were steamrolling up the field over and over again, not even two brutal mistakes early in the second half could slow their assault. The Jets, coaches and players, had rolled themselves into a ball of fear, hoping that the clock ran out before the Patriots could catch them. It didn't, and the monkey was still firmly on their back. Enter Brett Favre. 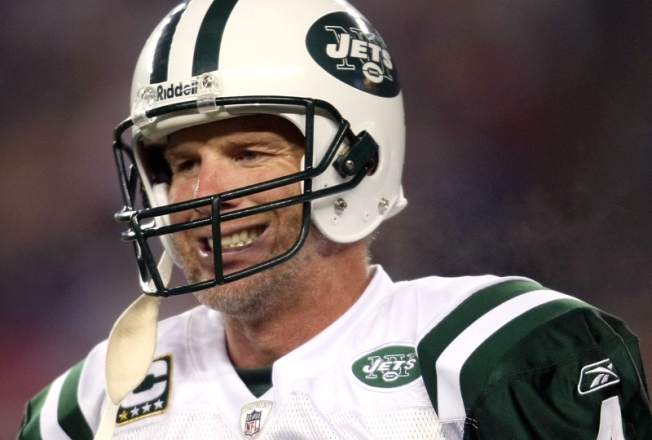 All the hyperbole and all the overwrought testimonials seemed a bit hollow compared to the Favre that had been playing in New York this season. He'd been better of late, but more of a game manager in the Chad Pennington mold, than the guy who could lift teams to victory using nothing more than his gumption and right arm. But, with 10:12 to play and the ball on their own 33-yard line, the Favre of lore showed up. He went 4-of-5 for 29 yards, numbers that won't blow you away, but the Jets moved sharply for the first time since halftime and gave that monkey a good swift kick. It was nothing compared to what he'd do after the Jets defense again made Matt Cassell look like Joe Montana, Johnny Unitas and Tom Brady all rolled into one. Getting the ball to start overtime, Favre completed 5-of-6 passes, four of them for first downs, and looked nothing like Pennington. His balls zipped through the air, he read gaps in the defense and inspired confidence like the player from all of those stories. There's a lot of football to play this season, and the Jets may still drive themselves into a ditch. God knows they tried to do it last night. Thoughts aren't about the absymal coaching and inept secondary play this morning, though. And, even better, they aren't about the enduring genius of Bill Belichick. They are about Favre, doing what he was brought here to do, and about the fact that the monkey, clawing and scratching every minute, has finally been dismissed.